The club had many homes in the city - the records make mention of Princes Street, George Street, Queen Street, St Andrews Square, York Place, and Hanover Street for instance. In the years leading to the centenary of the club it must have been apparent that the moving from place to place was not satisfactory and a movement began to find a permanent home. This must have been a considerable undertaking, for property at the West End has never been cheap. Fortunately there was a legacy from Mr J G Thomson and the members included a number of men of means, including such as the Earl of Perth who made a number of generous donations to the club. The money was raised with the help of a debenture issue and the current building in Alva St was purchased in 1922. The opening ceremony took place on the 4th November - the same day as the 100th Anniversary dinner. 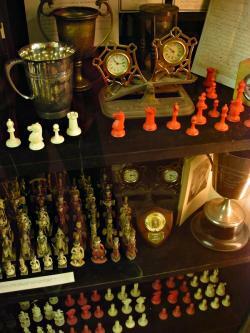 Owning its own premises gave it a unique position amongst UK chess clubs and there are very few if any who can boast of a similar facility.